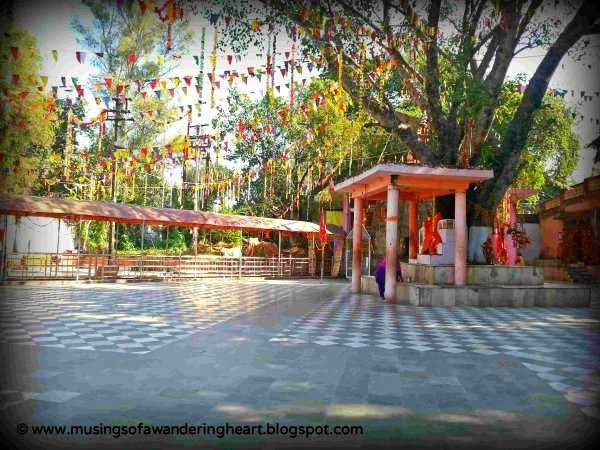 We have completed the trek of Mata Vaishno Devi Shrine along-with darshan of Bhairon Temple which is situated about 2 Km further, in our third post. 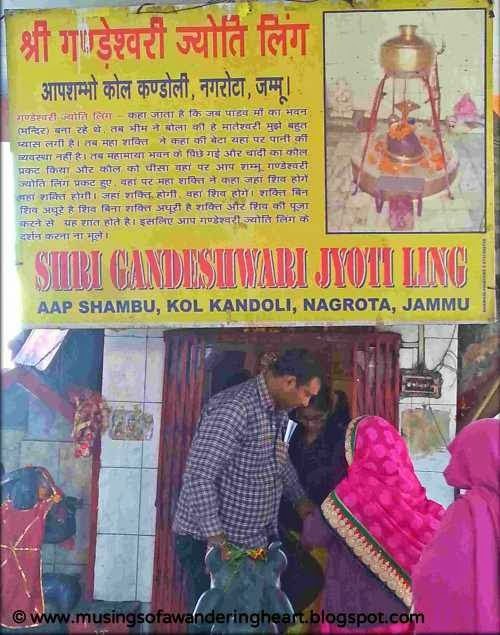 In this last and final post we will visit Kol Kandoli Temple at Nagrota and Deva Mai Temple at Katra. These temples hold a key importance in the Vaishno Devi Pilgrimage as it is said that Mata Vaishno Devi has spent time here granting boons to the devotees. We visited Kol Kandoli temple but couldn’t visit the Deva Mai temple as we were not aware of the same initially. I have gathered some information about the same from the net and given here for the readers interested in the same. 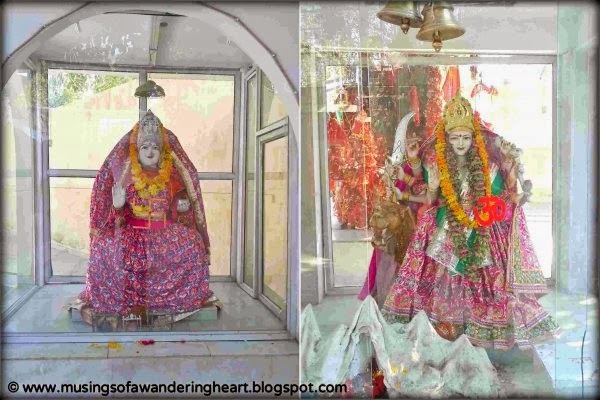 The Kol Kandoli Temple is situated in Nagrota town in Jammu district of the state of Jammu and Kashmir. It is about 14 Km from the main Jammu city and is situated on uneven low valleys in the Trikuta hills on one side and river Tawi on the other side. 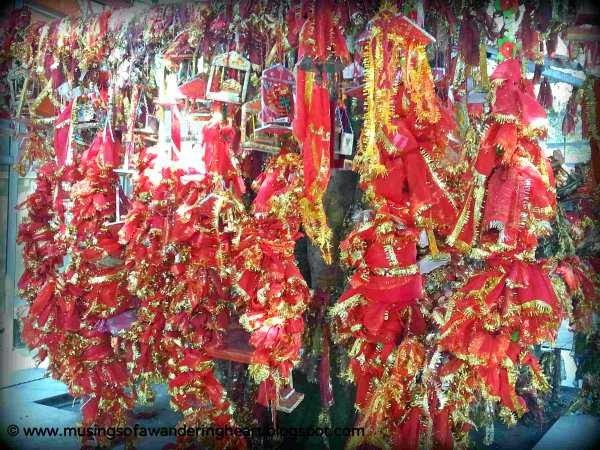 Kol Kandoli is said to be the first darshan of Mata Vaishno Devi or the first step of the pilgrimage. 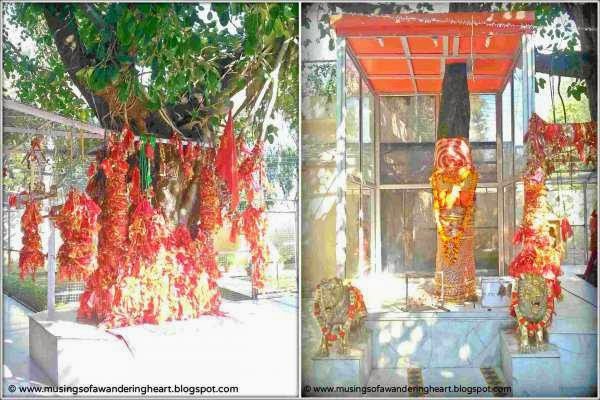 As per the legend, the Mata emerged here at the age of five in Dwapar Yuga and meditated here for 12 years before manifesting here as a rock formation (Pindi). The Mother Goddess resides here as Mata Mahamaya and fulfils the desires of the devotees. Mata used to play here with small girls and used to swing on the nearby trees. To continue this tradition and also to let devotees experience the bliss, lots of swings have been established on many trees. During the 12 years of her meditation and stay, the Mata used to frequently undertake Yagya and offered food to the needy. It is said that about four times the Mata brought silver bowls (known as ‘Kol’ in the local language) here from which She offered food to all 33 crores of lords and deities serving them all 56 kinds of delicacies from those bowls. 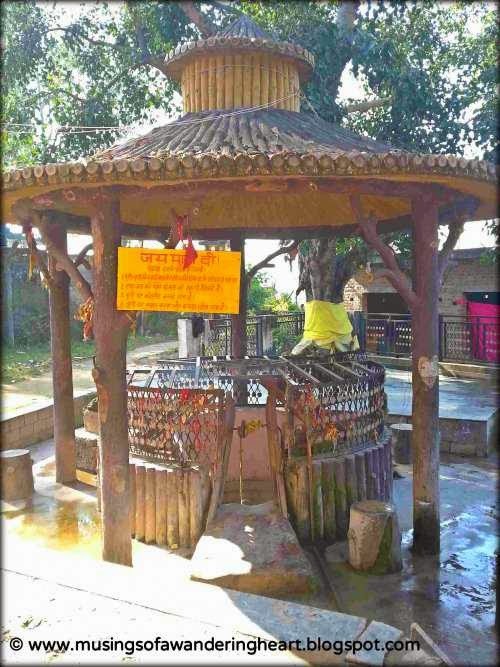 Later when Mata shook the bowl (known as ‘Khandolna’ in the local language), the water gushed out of it from which everyone quenched their thirst. 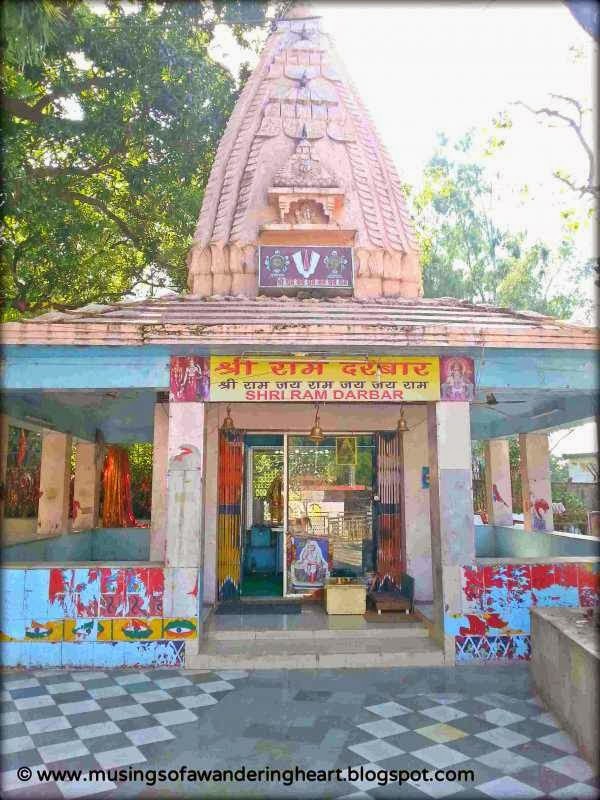 The legend further goes that when during the Mahabharata times in Dwapar Yuga, the Pandavas were shunned off from their kingdom and were texiled for 13 Years, they came to know about Mother’s abode here in Naagraaj village (older name of present day Nagrota), who fulfils all the desires of her devotees. Then Pandavas with their mother Kunti came here with a prayer to Mata to end their exile and reclaim their kingdom. Mother Goddess Mahamaya then told them to first construct her temple here and then all their wishes would be fulfilled. 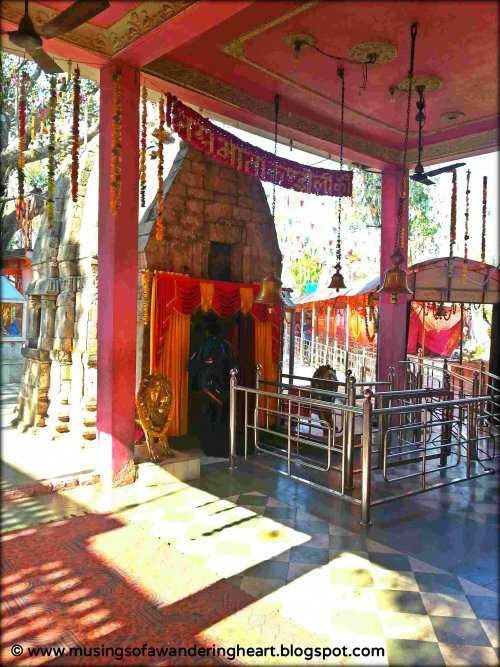 It is said that the Pandavas constructed this temple of Mata in one night which lasted for 6 months (as at the request of Pandavas, Lord Hanumaan eclipsed sun for the period of 6 months). We hired a taxi back from Katra to Jammu railway station via Kol Kandoli Temple and couple of other places in Jammu. As we reached the temple in Nagrota and entered the temple premises, we found the bhaint prashaad shop selling flowers, chunni and prashaad to be offered to Mata Rani. 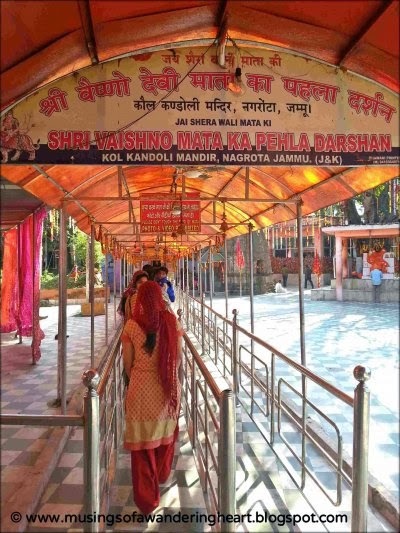 Everywhere on the boards and signage it was mentioned that this is the first darshan of the Mata Vaishno Devi (Shri Vaishno Devi Mata ka pehla darshan). Just after entering the temple gate is the darshan queue for the devotees to take darshan of the main temple of Mata Rani. There was very less rush and virtually no queue (as perhaps it was Monday – the working day). The temple premise is huge spanning across a wide area. The environment & surrounding is very peaceful and one can surely feel the bliss within while sitting in the temple premise. The premise is full of trees from which may swings are suspended to let devotees swing and feel the bliss. There are many temples within the complex which houses the statue or photograph of almost every Hindu deity. Most of these temples are installed and erected by the temple authority. However, there are three darshan which relates and dates back to the time Mata’s emergence at the temple. This is the main temple of Mata Mahamaya which was constructed by the Pandavas. The darshan queues take us to the sanctum sanctorum of the temple which houses the revered Pindis (rock) and a brass idol of ‘asht bhuja’ (eight handed) Mata riding a lion. Also, there are two brass lions installed at the gate of the temple as if guarding Mata Rani’s abode and symbolizing her fieriness and power. At the extreme end of the temple premise beyond the Shri Gandeshwari Jyoti Linga there is a well which is said to have emerged when Mata rubbed the silver bowl at the earth’s crust. The water of the well is said to be sacred and have medicinal qualities especially for skin related diseases. Devotees also take this water in bottles and preserve the same at their place of worship at their home. As mentioned above, there many beautiful and divine temples at the Kol Kandoli temple premises. Each of the temple and the beautiful idols therein offers peace and composure to the devotees. 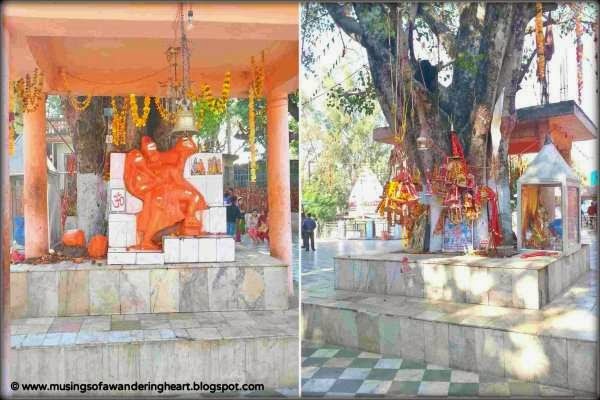 Lord Hanuman Idol: Just in the middle of the temple premise, there is a tree on the one side of which is an idol of Lord Hanuman and on the other side there are some pictures of Mata placed with offerings of chunnri, flowers and chattar made. 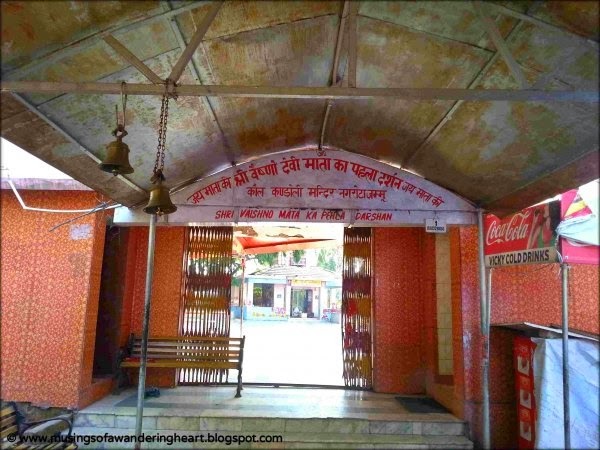 Teerath Dhaam: As one walks to the left of the main temple of Mata, there is another gate which takes the devotees to the temple named as “Teerath Dhaam” (Teerath meaning Pilgrimage and Dhaam meaning abode). There is large hall which houses many idols of almost every hindu deity very neatly captioned. 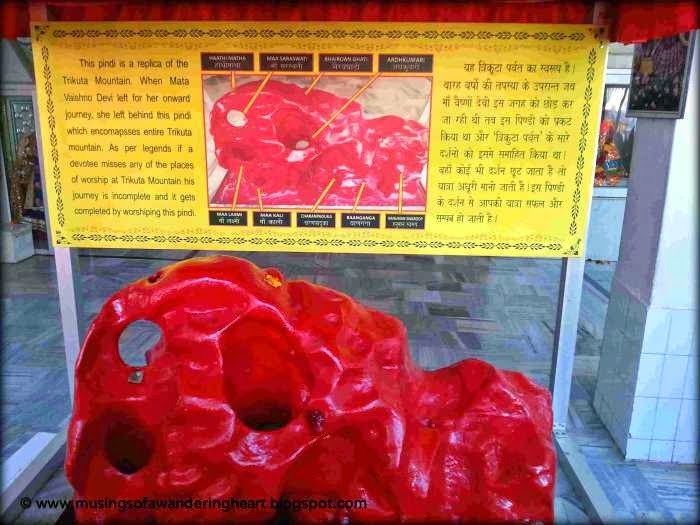 Inside the Teerath Dhaam, apart from the many idols and pictures, there is also a pindi which is a prototype of Trikuta Mountains replicating the whole Vaishno Devi Treck and its key places. It is said that when Mata Vaishno Devi left for her onward journey, she left behind this Pindi which encompasses the entire Trikuta Mountain. 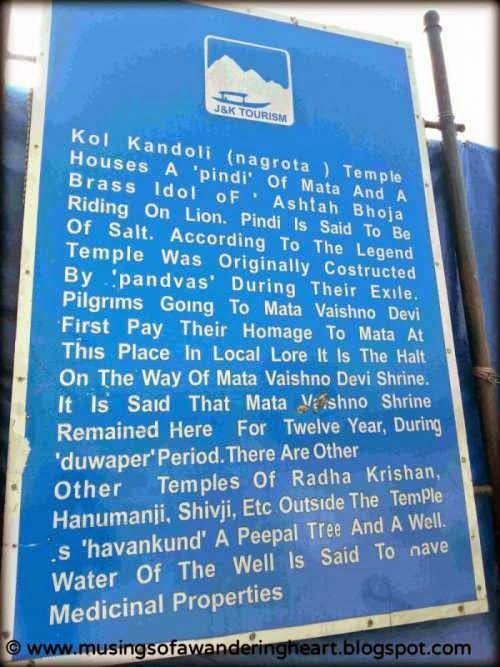 As per the legend if a devotee misses any of the places of worship at Trikuta Mountain his journey is incomplete & it gets completed by worshipping this Pindi. Once the devotees complete the darshan inside the Teerath Dhaam, just before the exit on the right side there is another gate which takes them to an open area which has many trees and idols of Mother Goddess, Lord Hanumaan & revered trees where devotees tie chunri as a mark of respect and reverence to Mother Goddess. There is also a signboard which narrates the story and legend of the mother and also of the tree there known as “Akshaya Vat”. 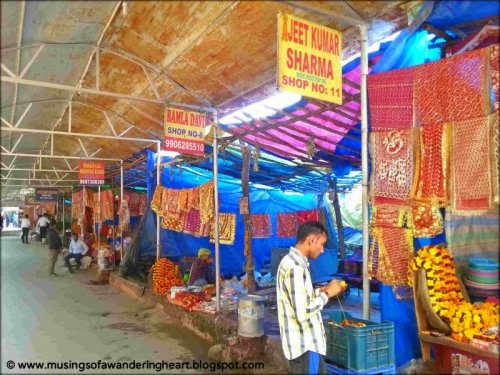 Shri Ram Darbar: Walking further besides Teerath Dhaam, one approaches another temple “Shri Ram Darbar” which has the colourful idols of Shri Ram, Shri Laxman and Mother Sita along-with the idol of Lord Hanuman. Outside the temple we found a picture of Sai Baba pasted on the glass door. Other Temples: Few steps further, there are some 4-5 stairs descending which take the devotees to another area where temples of Shri Gandeshwari Jyoti Linga, Shri Sai Baba, Shri Shani Dev, Shri Tirupati Balaji and others can be found. Behind these temples is the Mata Rani’s Tube well whose water is considered auspicious, as discussed earlier. There is another temple known as Deva Mai which is in Katra which is considered to be the second darshan of Mata Vaishno Devi. Unfortunately, we couldn’t visit this temple as we were not aware of the same at that time. I have gathered some information from the internet regarding the temple and legend thereof which is given below. 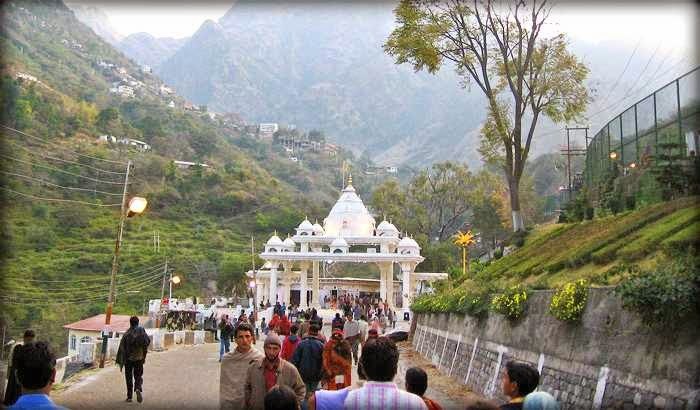 Around 4 Km before Katra on Jammu-Katra road, a diversion of 3.5 Km leads to Deva Mai, traditionally considered to be the second Darshan on the Yatra of Shri Mata Vaishno Devi Ji. In the olden days there used to be a walkway to Deva Mai from a village called Numai, situated near Katra. With the development of the road, now the way to Deva Mai goes from the main Jammu-Katra Road. 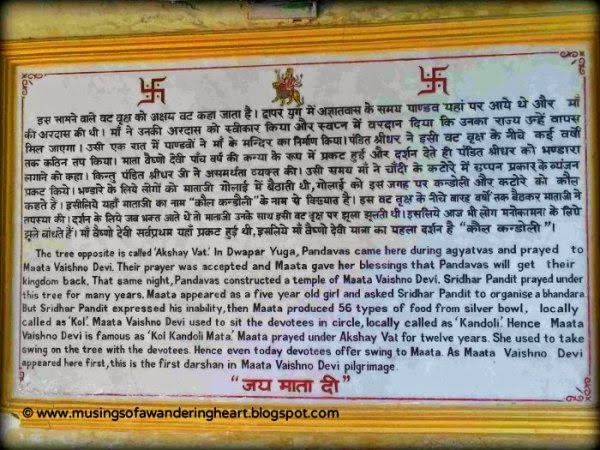 Legend says that while Mata Vaishno Devi has Her abode in the Trikuta Mountain since Treta Yug (the second of the four eras as propounded by the Indian spiritual tradition), it is in Kaliyug (the present era) that She stayed at Deva Mai in a small girl form and completed Her Tapasya (spiritual discipline and ascetic practices) of the human form. The priests at Deva Mai narrate a story of one Pandit Shyami Das, whom they say belonged to the fourth generation of Pandit Shridhar. 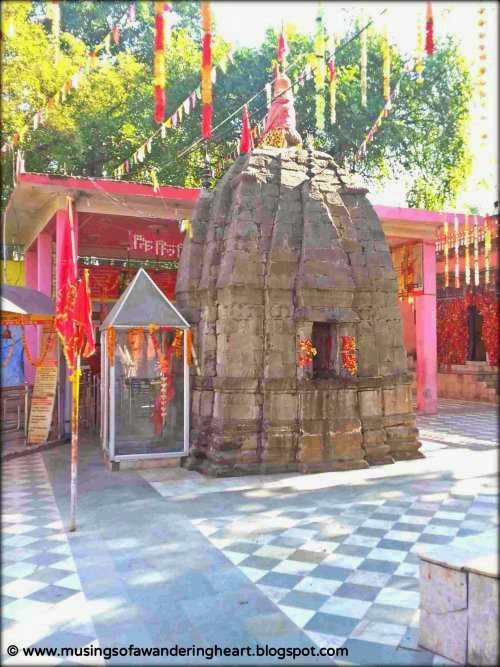 Pandit Shyami Das lived separately from the rest of the family at the place where the temple of Deva Mai is situated. He used to visit the Holy Cave every day for Darshan and Poojan and only upon returning back used to break his fast and eat something. Once when he returned home in the evening after the day's work, he got the news that his wife who was expecting a baby has delivered a girl child. An ancient tradition of India believes that at the birth or death of a family member, the whole of family has to observe certain days of abstinence, whereby they cannot visit any temple or perform their daily rituals. 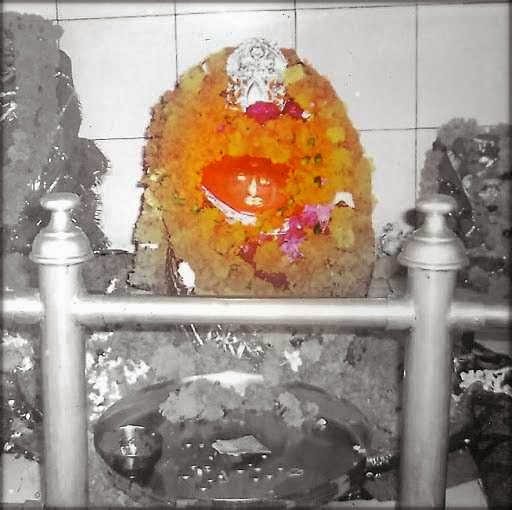 This period during which all religious and spiritual activities are prohibited is known as 'Sutak' and hence Pandit Shyami Das, upon receiving the news of the bil1h of his daughter, took upon the vow that he will observe complete fast during the Sutak period and will eat or drink anything only after Darshans and Poojan at the Holy Cave. In the same night, the Divine Mother in his dreams said to him that it is actually She who had taken birth as his daughter and how can the occasion of Her birth in his family be considered to be a period of abstinence from any religious rituals? Pandit Shyami Das was overjoyed with the arrival of the Divine Mother in his family but was however struck with the dilemma of naming the girl child. On one hand he could not name Her as any other girl as She if was his mother and on the other cannot even call Her Mother due to social considerations. Thus he named the girl child as Mai Deva, which literally means 'The Mother Divine' but in local language also means 'By blessings of the Mother'. 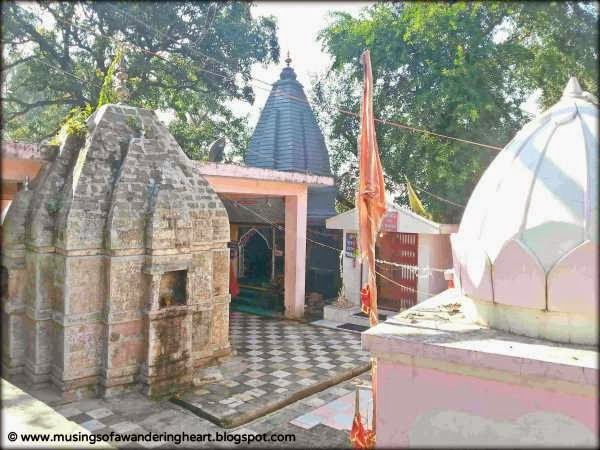 The Divine Mother is believed to have stayed at this place for a period of 110 years in a small girl child form and observed various spiritual disciplines, while also granting boons to all those who visited Her to pay their obeisance. When Her Tapasya was complete, She is said to have converted Herself into an idol form in front of Her devotees and since then that same idol is worshipped here. It is also said to host a Trident used by Mata. The Trident is worshipped too along with the statue and is available for Darshan to all the visitors. A mango tree planted by Mata is also present a few furlongs away. In the olden days, the route to Katra passed through Deva Mai and visitors preferred this place for their night halts before embarking on their onward journey to the Holy Cave. Post development of a direct road to Katra and all the required facilities there, only very few visitors visit this temple now. It still remains a place worth visiting, with its natural scenic beauty, views of Trikuta and the divine serenity. 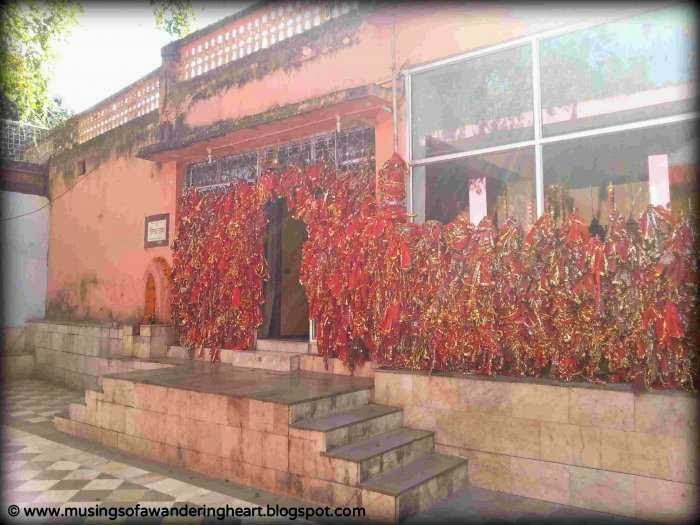 As mentioned above, though we could not visit Deva Mai temple this time, the place remain in my wish list now and would surely visit there during my next trip to Mata Rani’s abode. With this we complete our journey to Mata Vaishno Devi. . Hope you all had a divine time reading the posts and if you could actually feel the vibes or the bliss anytime while reading the post, I would feel blessed. Jai Mata Di !! Note: Pictures with asterisk (*) are sourced from the internet and rest have been clicked by me from my smartphone. Legend of Mata Rani has been adapted from Shrine Board website.